Lancashire did not exist as a county in 1086 and Poulton appears in the Yorkshire section of the Domesday Survey, one of over 60 local villages in Amounderness. Unfortunately no details are given about these communities. Domesday records 3 churches in Amounderness but does not say where they were. However it is extremely likely that a church has stood in Poulton since Anglo-Saxon times. Poulton was part of a very large Anglo-Saxon parish of Kirkham. 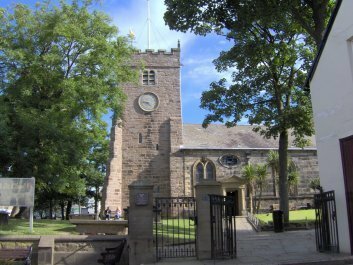 The dedication of the church to St Chad, an Anglo-Saxon bishop, is taken as further evidence that a church stood in Poulton well before the Norman Conquest. The first written evidence for a church in Poulton is a document drawn up in 1094 when Roger de Poitou, the Norman knight to whom Amounderness had been granted after the Conquest, presented the church in Poulton to the Abbey at Sees in Normandy. It was accepted practice for this to be done, and Poulton church, together with other churches in Amounderness, including the newly built church dedicated to St Mary at Lancaster, remained in the hold of the Norman Abbey until Henry IV dissolved the power of foreign abbeys to hold land in England. Poulton has never belonged to a major landowner and so the township has no important and useful documents such as Manor Court Rolls. After the Reformation, Queen Elizabeth passed the church to members of the Fleetwood family, but the majority of landowners in Poulton continued to be local people owning small farms. Built on one of the few low hills in the western part of the Fylde, near to the River Wyre, for centuries Poulton provided a natural social and commercial centre for the many tiny hamlets which lay over a wide area reaching from Lytham to Kirkham. Over the centuries Poulton became an important market town providing local farmers and families with the many services they needed - blacksmiths, farriers, nail makers carpenters and joiners, shoemakers, dressmakers and tailors and all manner of food suppliers. The market cross still standing in the square is a reminder of the days when it served as a sign that regular markets were held there. Poulton has no market charter, and the earliest mention yet found of a market in Poulton was identified by Dr Alan Crosby in a document of 1628, but it is very likely that markets have been held here for centuries. 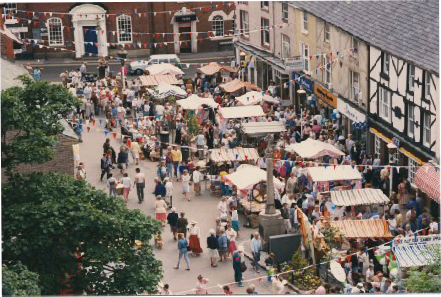 This view from the top of St Chad’s church tower shows the Market Place with the Victorian Market held in June 1997.